7th Annual Walk/Run/Eat for Safe Schools a super success! Thank you to everyone who came out for the Walk/Run/Eat for Safe Schools on Sunday, October 13th at the Goodman Community Center. We had a day of great weather, great costumes, and great community! In case you haven’t seen them yet, race results for the 5K and 10K race can be seen here. This event could not happen without the super-team of volunteers that help with registration, timing, act as course marshals, and help set up the gym in the morning. A special thanks to Sue Ryan, our graphic design volunteer who has created the look and logo for our event since its first year back in 2007! 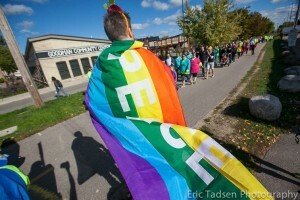 Did you attend the Walk/Run/Eat for Safe Schools? We would love to hear your feedback. Fill out our short online survey here. This year’s Superheroes, the folks who make the commitment to try and raise $500 apiece, brought in just over $30,000 for GSAFE. There is still time to donate to our Superheroes! Access our Walk/Run/Eat for Safe Schools fundraising page here. Photos from the Walk/Run/Eat for Safe Schools can be seen on both the GSAFE Facebook page, the Our Lives Magazine Facebook page, and on our website here. Thank you to all our generous donors and sponsors! You are our superheroes! The 2014 Walk/Run/Eat for Safe Schools will be on Sunday, October 12th. Mark your calendars! Photo credit Eric Tadsen Photography and Our Lives Magazine.